The start of Chungking Express (Wong Kai Wai, 1994) is definitely an interesting one, at least of me. I cannot recall the last time an opening sequence made use of a slow shutter speed on the camera to show a fast pace environment and movement. This type of cinematography caused confusion at first as I'm not accustomed to it but after discussing it among by peers to make sense of it I've decided I quite like it. Normally this is done by lots of fast cuts, usually accommodated by shots of a large crowd. I feel that Wong Kai Wai choose these settings to get across to the audience the fast paced nature of not only the chase between the two leads, but also of time moving fast as she covers a long distance due to the large city in which the film is set. Below you can see the screenshots from the opening, the blur caused by the slow shutter speed. 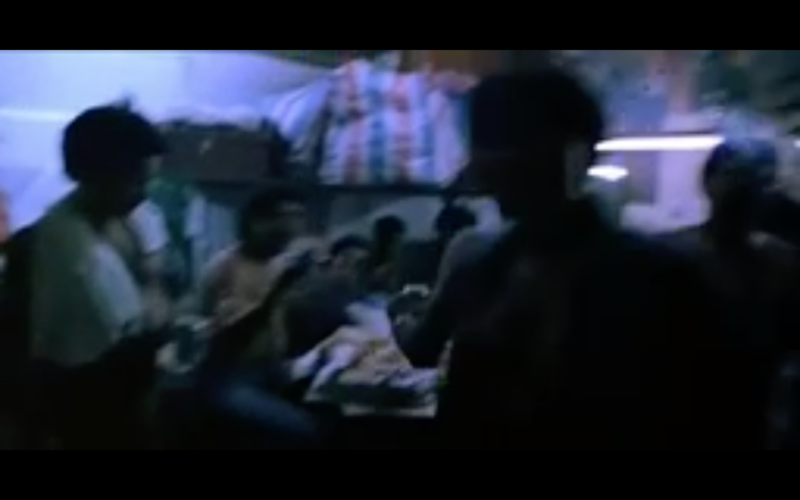 The mise en scène for Chungking Express comprises of a 1990's poor Asian neighbourhood. This is reinforced by the dark, dirty, grimy feel of the location. No bright colours, the people are wearing either dirty closes or just plain white singlets for as far as the eye sees. The only two characters in the opening sequence that are dressed are the male and female leads. The male, a cop wearing a richer set of clothes signifying & the female lead, a drug dealer the same. The storm sounds overhead also signifies that either a big storm is coming, or perhaps it's already here, and that the next few days are going be tough.